Vampires vs. Werewolves | Comparison Post | You Decide! Vampires vs Werewolves: Who would Reign Supreme? So this month I started reading the manga Wolf Guy (2007) by Yoshiaki Tabata and Yuuki Yugo. Naturally, it’s about a werewolf who ends up having an awkward romance with his teacher and, well, things get complicated. It’s a reboot of 1970s manga of the same name that Japan made into a somewhat strange love action movie in ’75. I quite enjoy the gore and dark themes of the story. Then, I started watching the new Netflix series Van Helsing, which, according to the SyFy network, is a reimagined Dracula story in a modern American setting that is loosely based off a comic. Apparently, Vanessa Helsing is supposed to be the daughter of Abraham Helsing, and in 2018 the world plagued by savage vampires after ash from a volcano darkens the skies. She later learns she has regenerative powers and that her blood cures vampirism. Oh! And, if you haven’t seen it, check out the Castlevania anime on Netflix. It’s short for now, but has plenty of gore and rich story! Earlier in the year, I tried to read Bram Stroker’s Dracula, but I struggled to get through it and gave up for now. The language and pace of the plot are aged, to say the least. Nearly all of it is told through journal entries and correspondences, which made me think of that trend of low budget horror films where it’s all viewed through “found footage” with a cheap handheld camera. Besides being unrealistic, why did anyone actually think Paranormal Activity was scary? I thought they were fairly dull and sometimes oddly funny. Anyway, did Jonathan Harker really have time to record dozens of pages in his journal? Maybe so, but he could have prioritized that time to escape. I guess it makes the story after all. I’ll finish Dracula one day. Work has me bogged down reading about fancy cars and air conditions. It seems recently the zombie craze has overtaken Western culture. But I’ve always thought vampires deserve higher standing on the monster podium! Who’s the vamp’s biggest competitor? Werewolves, naturally! So I thought to thoroughly compare them! Vamps have a long tradition in literature, film, and video games. I never cared to watched Vampire Diaries or Twilight (we’ll just pretend that doesn’t exist), but the Blade and Underworld series, 30 Days of Night, with the Elder Scrolls and Castlevania video games provide some strong foundation for the vampire lore in the modern mind. Let’s not forget the TV series Supernatural! Our heroes Sam and Dean staked more than few bloodsuckers! So what does all this tell us? Vampires have awesome raw strength while suffering some obvious drawbacks. The fact vampires can never naturally die is probably the most appealing thing about them. Typically, vamps settle in small, underground hunting packs (if they aren’t part of the upper echelon), but they could, in theory, travel the world forever! Right now, I would travel the globe and see everything, but, unfortunately, I don’t have the time. Like most miserable humans, I am stuck with obligations at work and have financial constraints. Since vampires live forever, they wouldn’t care about such trivial, mortal things. It would be fascinating to watch civilizations rise and fall over centuries. Much like Marvel’s Wolverine, time is relative to these monsters. Thus, they are usually detached from and apathetic towards world conflicts. In the long run though, living forever could be a curse! You might get bored of life and tire of seeing people come and a go (assuming you bother to make friends with humans). If you’ve ever seen a vampire movie or show, you know the crazy physical power vampires are capable of wielding. Normal humans can never really overpower a vamp by force alone. In hand to hand combat, they could toss you against walls with a light flick of the wrist. Then they also have their fangs and claws to attack a foe. Even still, they certainly aren’t as physically strong as werewolves. Yet, werewolves don’t have much control when they Hulk out and cannot wear armor or use weapons. Vampires sometimes seem similar to zombies in that both hunger for humans, yet vamps have a distinct intelligence and culture. They have brains and a sense of refinement! Dracula lives in a huge castle! Maybe most of the rooms are old and dusty, but it maintained a certain style of elegance. Most of the times media presents vampires as prideful elites. For example, they don black robes, have decked out coffins, and dwell in elaborate evil lairs. Werewolves might live in dens of a forest or try to blend into human society. Between the two, vampires have way more style! Then again, this is just a preference advantage. If you prefer an old forbidden forest, then maybe a werewolf is more your cup of tea. Oh and vampire chicks can be extremely hot! Sonja, from Underworld: Rise of the Lycans, was quite the looker! Some people really love the gothic theme of vampires. Personal Preference – Vampires care about style, class, and fashion, while werewolves are feral beasts that live in the wild. Depending on what story we look at, vampires can transform into bats, gargoyles, or fiery demon forms. And, they don’t need to wait for a full moon! This utility provides powerful opportunities for escape and ambushes. Since they must travel at night, the ability to morph into a more agile form aids in their hunts. The potency of the vamp powers usually corresponds to the amount of blood they have consumed. So, I’d figure more blood would equal a stronger demon form and powers, Werewolves can transform too, yet have no control over when or what level savagery they unleash. They nastiest drawback for vampires is their constant need to drink human blood. I’ve seen films where vampires can live off cow blood, like the cute Little Vampire, but that’s the exception to the rule. This driving crave of theirs gives them a clear disadvantage over werewolves. Vamps are forced to create a strong hierarchy system to ensure high blood supply. Some stories involve vamps enslaving humans and treating them as cattle on farms. Other tales tell of humans making a nefarious tribute pact with the bloodsuckers. In any case, werewolves don’t need to worry about such things. Strong Disadvantage = Vampires need human blood to keep up their strength and powers, werewolves do not. The natural killer of vampires is sunlight. I guess if we’re talking Hotel Transylvania, then they could get by with an umbrella… but let’s be real! Direct contact with the sun would burn and melt any vampire to a crisp. This condition forces them to hide in caves, boarded up shacks, and underground dungeons. Only being active at night limits their ability to safely travel. In theory, all you need a UV lamp to toast a vamp! Strong disadvantage = sunlight can kill a vampire, while werewolves have no environmental weaknesses. The earliest vampires presumably came from Hell itself. Then, they increased their numbers by infecting strong humans with a fateful bite. Instead of just killing their victims, vampires can force them to join their kind. Potentially, vampires can continue to replace their number lose in battle like this forever. It would take a long while for a recently human-turned-vampire to get into the swing of things, but werewolves do not have the ability to replenish their numbers so easily. I actually Googled “how to become a werewolf” and found some “real” Wiccan spells for such a purpose. I know in Skyrim you could become a werewolf by drinking some ritual blood in the Companion’s little sanctum. Either process doesn’t sound as convenient or expedient since the person would need to willingly choose that lifestyle. Vampires can force their way of life on an unsuspecting human. In some films, a werewolf bite can infect someone with lycanthropy, but werewolves never seem to care about turning humans. They just blindly kill in their rage. Strong advantage = vampires can easily turn humans to add to their ranks, werewolves can not. Vampires also can have some miscellaneous traits, like not having a reflection, needing permission to enter a house, having aversion to garlic. I don’t think those would really change the outcome of a fight with a werewolf for them. While vampires have demonic strength, werewolves have more raw muscle power! They can jump much higher and run faster than any vamp! But, they do tend to leave a mess wherever they roam. I don’t think of werewolves as very sneaky or calculated killers. They simply destroy everyone and everything they can. I am not sure they really have a clear motivation either. The bright moon controls their impulses and forces them to destroy randomly. Again, vampires would be more likely to apply strategy and use armor. Slight advantage = werewolves have way more physical strength, but little control. Since they are essentially animals, werewolves have an increased sense of smell, sight, and hearing. They might be seduced by lunar forces, but they aren’t stupid. It would be almost impossible for anyone to sneak up on a werewolf, even when they are sleeping! Since they can detect threats coming miles away, your best bet would be to set traps. They have strong awareness, but won’t understand complex machinery. Thus, Invading a vampire castle might be daunting for werewolves, but in the forests, they reign supreme. Strong advantage = werewolves have the natural advantage over vampires in the wild. At some point, werewolves join a pack and form a close-knit family. In the wild, wolves are structured around an alpha male and female leadership with subordinate “beta” and “omega” members. Vampires might have an overload closer to a king or gang boss. Werewolves, on the other hand, work together as a family to survive. Vampires force cooperation to get more blood, which leads to ambition and civil wars. Werewolves have a simple life in the woodlands, and they develop a strong bond of unity. Undoubtedly, this characteristic would aid in combat. Slight advantage = both werewolves and vampires work in units, but the bond among werewolves stronger and not forced. The secret to a werewolf’s demises is a silver bullet to the brain! I am not sure why, but something magical about the element silver burns through their flesh. It takes bounty hunters forever to realize this fatal weakness, and (goodness knows why) they only carry a handful of silver rounds. I suppose silver weapons would be expensive. Anyway, while it is deadly to werewolves, I doubt vampires would use silver bullets or a silver tipped sword. Those are human weapons and not really the style of vamps. Have you ever heard of a vampire using a gun? From scouring the internet, it could be another post entirely to answer why exactly vampires don’t use guns. For starters, many are ancient and probably don’t know how to use firearms. And, of course, they are prideful stuck ups who don’t want to admit humans are better are at killing their rivals than them. 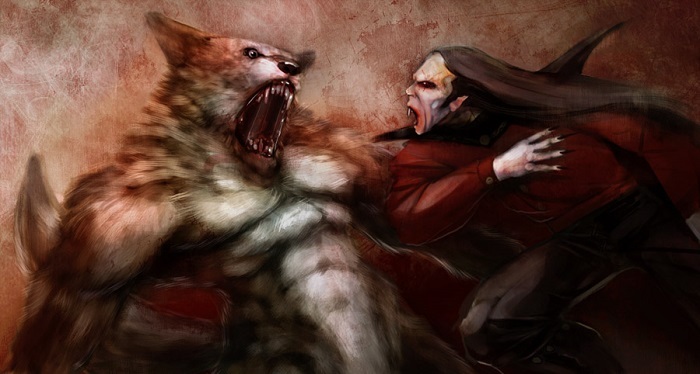 Slight disadvantage – silver weapons would be deadly against werewolves, but vampires would be unlikely to use them. Among monsters, werewolves are unique because they only turn into beasts once a month for a few days, when the moon is full. So, most of the time they could choose to live a normal life in a quiet village. Then, when the moon cycle is nearing its end, werewolves could just lock themselves inside a cage and hope not to break out after transforming. That scenario happened in one movie that totally slips my mind. Google isn’t helping (#sadface). If you want the chance at a somewhat normal life, then choose a werewolf over a vampire! Vampires need blood, so they need victims. If you lock yourself up, then you don’t actually need to kill or maim anyone as a werewolf. But I am sure any human wouldn’t trust a “well-meaning” werewolf, so you’d still need to keep it all under wraps. And, in your human form, you’d look and act fairly normal! Blending into society is certainly not needed, but it’s nice to have that option. Personal Preference = werewolves have the opportunity to integrate into normal society if they take the right precautions. Fun fact: There actually is a real “werewolf syndrome” disorder that causes an abnormal hair growth all the body. It should be noted that both vampires and werewolves have rapid healing abilities. I haven’t found anything online saying that one heals faster than the other, so I’d these advantages cancel each other out. Analyzing the monstrous baddies was fun… By the way, I’d be thrilled to blog to compare your products or services. Just shoot me an email to get in touch with me for my freelance writing services.